For everyone interested in early helicopter history, the Bell 47 Helicopter Story is for you! This book was put together by real enthusiasts wanting to tell the story for others and is thoroughly detailed to date of development of the world's first commercial helicopter. This book features over a 1,000 photographs and diagrams of every Bell 47 ever built or proposed, many of which have never been published before - taking 12 years to create! The authors Robert S. "Bob" Petite and Jeffrey C. Evans teamed up and researched their subject meticulously, with contributions from former Bell employees, old articles and other reliable sources. The story begins before the end of World War II at the Bell Aircraft Corporation's leased auto dealership garage in Gardenville, New York. Here President Larry Bell set up his "Gyro Test" program to develop the Bell Model 30 Helicopter, under the direction of inventor Author Young and associates. The development and construction of four versions of the Model 30 are covered in detail. The successful Model 30 program morphed into the Model 47 helicopter and the birth of a new civil rotary-wing industry. All models of the Bell Model 47 are covered, from the preproduction Model 47 prototype to the moment when the last Bell 47 came off the production line. 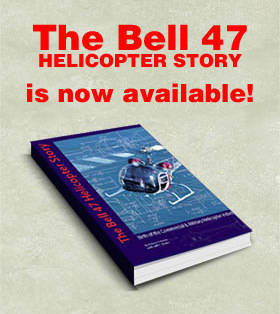 You will learn all about the early helicopter operators who purchased new Bell 47s and more. In fact, I am confident all readers will learn something new about the Bell 47 that they did not know before. This memorable Bell Model 47 history book will set new aviation standards, due to its in depth quality and amazing selection of photographs and detailed captions. This book is one that you will dip into time and time again, especially if you have a passion for this long-living helicopter. Spoil yourself and order a copy today!